Paul di Resta is an up-and-coming Scottish racing driver who, having made a splash in the DTM driving for Mercedes, is now making the transition to Formula One. He is currently the reserve driver for Force India, appearing for the team at Friday practice sessions whenever practicable, and has expressed his intention to turn his reserve role into a race drive by 2011 if at all possible. Paul di Resta was born on April 16, 1986 in Uphall, West Lothian and is the cousin of double IndyCar champion Dario Franchitti and his brother the well-respected sportscar racer Marino Franchitti. He started his racing career in karting, racing in various series between 1994 and 2001, before stepping up to the British Formula Renault Winter Series in 2002. He joined British Formula Renault full-time in 2003, and remained in the series throughout 2004, also driving in some Eurocup Formula Renault 2.0 events. Di Resta moved up to race for the Manor Motorsport team in the Formula Three Euroseries in 2005, winning the prestigious McLaren Autosport BRDC Young Driver of The Year Award (which had also been won by Dario Franchitti in 1992) and the championship in the next year. To do that he beat his team mate the current Formula One Red Bull driver Sebastian Vettel. Di Resta also won the 2006 BP Ultimate Masters at Circuit Park Zandvoort during that year. In 2007 di Resta raced in DTM for Mercedes, finishing fifth overall in the championship behind Mattias Ekstrom (who won his second DTM title), Bruno Spengler, Martin Tomczyk and Jamie Green. He was the highest-placed driver in the standings to pilot a non-2007 car. His performances earned him a 2008 Mercedes C Klasse for the 2008 season as a reward for his exceptional debut season. Di Resta raced a strong championship, winning two races and finishing second in the points, just four points behind eventual champion Timo Scheider of Audi. In 2009, he finished third overall, behind Scheider and compatriot Gary Paffett. Di Resta tested for the McLaren Formula One team as part of his BRDC Young Driver prize and was considered for a drive with the Force India team for the 2009 season due to the influence of the teams’ shared engine supplier, and di Resta’s DTM backer, Mercedes-Benz. However, Force India chose to retain Giancarlo Fisichella and Adrian Sutil, with Vitantonio Liuzzi as reserve driver. In December 2009, with Fisichella moving to Ferrari and Liuzzi being promoted to the race team, di Resta took part in a test with the team at the Jerez circuit in December 2009, alongside reigning Indy Lights champion JR Hildebrand. In February it was announced that di Resta would be the team’s reserve driver in 2010. In interviews given at this time he made it clear that he is aiming to race for the team in 2011. Force India describes him as “one of the hottest young British racing talents”. The team said its policy would be to allow him to participate in Friday practice wherever practicable and wherever it did not disadvantage a race driver needing to learn a new or unfamiliar circuit. Di Resta thus missed the season-opener in Bahrain and made his Formula One race meeting debut at the 2010 Australian Grand Prix, where he took part in the first free practice session in place of Sutil. Following completion of the session, Di Resta was placed 11th, one place ahead of Michael Schumacher. He also drove in the first Friday practice session in Malaysia. 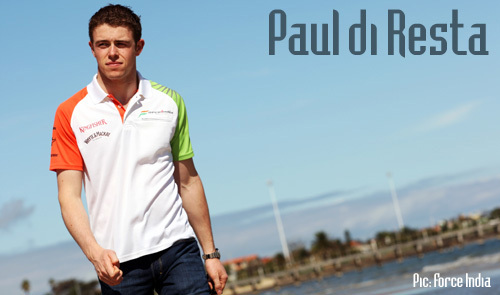 For more information on Paul di Resta, visit his driver page on the Force India site or read up on his career at Driver Database.